On Sunday morning I had two choices, run on the treadmill and remain warm or go on an adventure and risk frostbite. I chose the latter. Sunday morning I woke up and put on many many layers and then went to meet Lyndsey, her dad and some other trail runners. We ventured to Brandywine State Park, a place I had never been until Sunday. I love running. I think nature and trails are beautiful. I enjoy a hilly challenge every now and then. I think visiting new places is swell. I had my Altra neoshell lone peaks (water resistant trail shoes), I was prepared. I was certain that I would enjoy this experience. It was below 10 degrees on Sunday and it felt like 0. The trails were snow covered. The trails were icy. The hills were mountains. I stumbled. I fell. Lyndsey and I got lost a few times. I have no sense of direction, thank goodness she does. 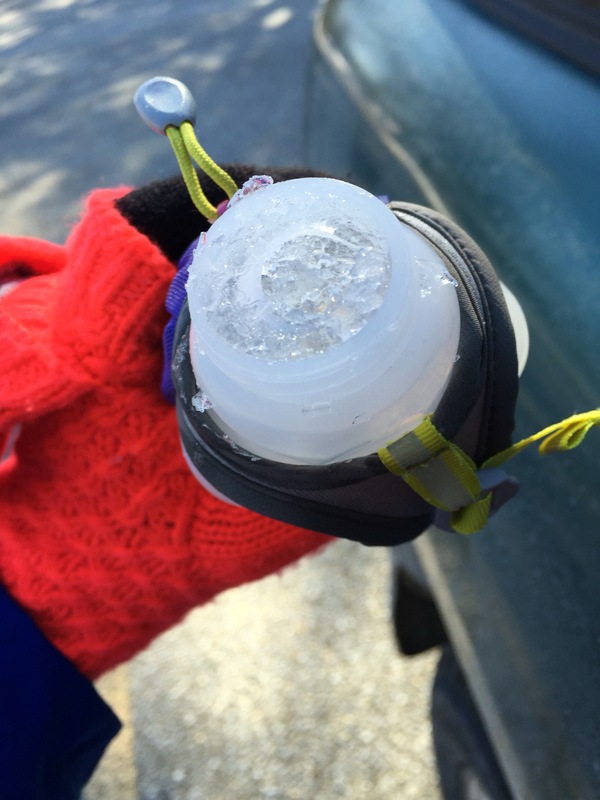 The handheld water bottle I was carrying froze as I was running. We ran 13 miles when we had only set out to run 10 or 11. At one point we spoke of nothing but Narnia and Turkish Delight. I thought we were in Narnia. I was sad when Lyndsey said she had Turkish delight one time in elementary school and it wasn’t that good. I hope I hallucinated that though. I was hungry. I was very hungry. And cold. We listed everything we could think of that was worse than running up snow covered hills when it was literally freezing. The list is long. Among that list was, “I could have run on the treadmill.” Believe it or not, even as I was clutching my bottle of ice I believed that running on the treadmill would have been worse. As miserable as I was and as cold as I was I was thrilled that I wasn’t running on the treadmill because that freezing run was the best run ever. I’ve never felt so miserable in my life, not even miles 18-26.2 of the marathon felt so hellish. I HATE the cold but I love to prove myself wrong and eliminate self doubt. I told Lyndsey that I would love the run when it was over but that was an understatement. This run was the best run I’ve ever had. It wasn’t the fastest run I’ve ever done. It wasn’t the longest run I’ve ever done. It was the most challenging run I’ve ever done and I’m proud of that. I’m also proud that I only fell once and that no blood was shed. Sometimes I doubt myself and my ability. Sometimes I question if I can actually do the things that I set out to do. If I can run 13 miles up gigantic snow covered hills in the freezing cold than I can do everything and anything else that I want to. Things may feel torturous, difficult, overwhelming, and absolutely impossible in the moment but if you don’t give up you’ll succeed and you’ll feel unstoppable. For the past few days I’ve felt unstoppable. Now I can do anything and I know it. It sounds like a really great run. I would love to run with you sometime soon! Well done! Always is better running outside despite the conditions, magical when its snowy and better euphoric feeling afterwards. I told you I would like it after we got warm!